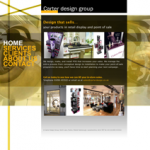 Last week Carter Design Group’s new website was ‘soft’ launched. Carter Design Group, based in the small Leicestershire village of Foxton, are point of sale display designers, manufactures and installers. The website was designed by Wavy at The Mitchesons, while we worked on the site’s architecture and turning the design into a responsive WordPress template. Less than a month since going live, the search engine results are very pleasing. For terms such as “point of sale designer” and “point of sale design” they rank 3rd and 5th in Google respectively. For “grocery merchandising” they are #2. While this represents a great start to our SEO efforts, there is still much to do!